Ellen Gould White (Harmon), November 26, 1827 – July 16, 1915. Ellen G. White is the most widely published Seventh-day Adventist author. Her ministry spanned 70 years, from 1844 until 1915. Ellen White is credited as the co-founder of the Seventh-day Adventist Church. Guided by the Holy Spirit, Ellen White exalted Jesus and pointed to Scripture as the basis of one's faith. She wrote on a wide variety of spiritual and practical topics, from spiritual, to health, education, ministry, financial and marital advice. Her best known most translated work is Steps to Christ, followed by the 5 conflict of the ages series: Patriarchs and Prophets, Prophets and Kings, Desire of Ages, Acts of the Apostles and The Great Controversy. EGW Writings for Windows 8 enables you to read and search The Complete Published Writings of Ellen G. White online. 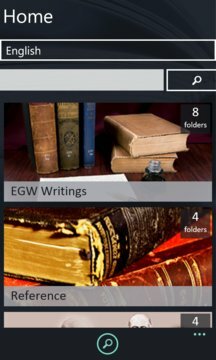 The EGW Writings App is available in 55 languages, for example: Chinese, English, French, German, Italian, Portuguese, Romanian, Russian, and Spanish. 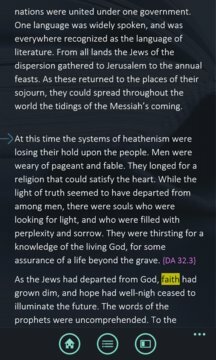 The App is great for reading EGW Writings or for word and phrase searches within an individual book or your entire library. The App also includes 7 Bible versions in English for direct linking to Bible references within Ellen White's writings. Many more features are planned in future revisions of the App.